The first time I heard Frank Cross was at the 1974 Society of Biblical Literature and American Academy of Religion meeting in Washington, DC where he delivered his SBL Presidential Address: A Reconstruction of the Judean Restoration. 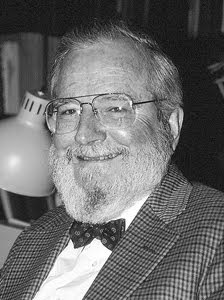 His passing last month at age 91 will be felt throughout the world of Biblical studies especially by his students. For those of us who followed his influence and control over the Qumran Scrolls, his legacy will marked by how the Scrolls were subjectively denied access to the scholarly world especially in the United States to those who were not part of the Harvard community. While the passing of Frank Cross is bemoaned by a number of his former students and called “The End of an Era” by Hershel Shanks, in my view Professor Cross will be equally remembered for his tight control over the Qumran Scrolls as noted by Shanks for “almost 40 years”. For those of us who followed the accessibility to the Scrolls, one could not help noticing that while the excuse was given that the unpublished Scrolls were denied open access usually due to the fact that only competent scholars (whatever is meant by “competent scholars” was highly subjective on Cross’ part) should translate these text; reality proved time and again that graduate students studying at Harvard under the mentorship Cross seemed to always meet that criteria – a criteria which also implied that other universities professors and their student were substandard. Thus, unlike the Nag Hammadi Codices which were given open access to all scholars, the Qumran Scrolls were sadly used by Cross to draw students into Harvard’s Division of Near Eastern Languages and Civilizations. Then too, Frank Cross (for all his expertise as an epigrapher and paleographer) seemed to have been in denial when one of his own Harvard team ceased to be a competent and qualified scholar as in the case of John Strugnell. One of Cross’ students told me that when he flew to Israel to study a Qumran Scroll he had been granted access to, he found a drunk Strugnell lying in a room at the École Biblique with stacked cases of beer and using his navel as an ash tray to which reality should have proven to Cross that alcoholism had clearly replaced his colleague’s competent and qualified scholarship quite some time back. In the final analysis, Franks Cross will be remembered for not only his sharp ability to date scripts, but his accomplishments will have to be tempered by flawed personal ideology that limited the Qumran Scrolls’ access mostly to individuals of the Harvard community; be they qualified or not.